Stephany Alvarez-Ventura MS ’11, a once-aspiring banker, now spends her days among honeybees and organic gardens. The Dominican Republic native worked part-time at a bank in high school. Upon graduation, she enrolled at FIU to pursue a career in finance. But an essay project in an English class piqued her interest in the environment, specifically pollution. She shifted her career aspirations and began pursuing a degree in environmental studies. During that same time, she married her high school sweetheart, bought her first home and started a family. “When I was eight months pregnant, my environmental sciences labs involved taking water samples from filthy canals and trekking the Everglades swamps in a kayak to study ecological restoration. I loved it,” Alvarez-Ventura said. After the birth of her daughter, she landed an internship at the U.S. Environmental Protection Agency’s Office of Ground Water and Drinking Water in Washington D.C. Upon completion, she was offered a job as an environmental science tech with the agency, but decided to return home to Miami and further her education. Like many before her, Alvarez-Ventura was drawn by the enthusiasm of Earth and Environment professors Mahadev Bhat, pictured above with Alvarez-Ventura, and Krish Jayachandran. Likewise, the professors were impressed with her. They helped her secure a research assistantship to pursue a master’s degree. She devoted her thesis to studying colony collapse disorder — a serious disease affecting honeybee colony health and its ability to pollinate crops. Alvarez-Ventura found the support she needed to finish her studies, but she also found a family at FIU. Today, she is the program coordinator with the FIU Agroecology Program and continues to foster new relationships throughout Miami-Dade County. She works closely with the program’s Organic Garden, which was designated a People’s Garden—one that benefits the community and invites the collaboration of various partners—by the U.S. Department of Agriculture. She also helps develop and manage programs for local communities, area K-12 schools and more. Since its inception in 2005, the Agroecology Program has awarded more than 150 scholarships to undergraduate and graduate students like Alvarez-Ventura. 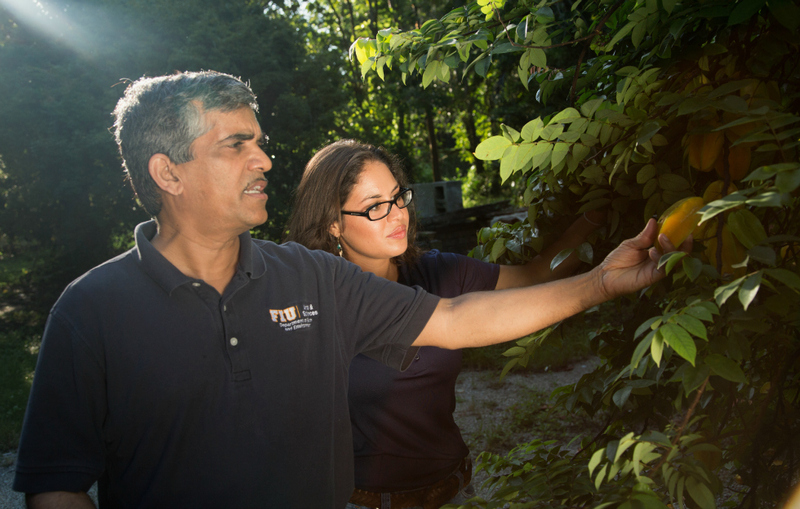 In 2012, FIU became one of the first universities in the nation to receive the USDA’s Hispanic-Serving Agricultural Colleges and Universities designation, which Alvarez-Ventura says is a testament to her alma mater’s commitment to people like her. Looking to the future, she hopes to pursue a Ph.D. and mentor the next generation of female and minority agriscientists as an extension of what her mentors did for her. Excelente! Pasión y conexión con la naturaleza en una vocación donde ha sabido unir una tradición de familia, sus competencias y habilidades junto a un espiritu emprendedor. Felicidades y una exitosa carrera Stephanie Alvarez Ventura! Excelente! Pasión y amor por la naturaleza: hermosa tradición de familia que ha sabido unir a sus competencias y habilidades profesionales, sentando así, las bases que puedan traernos de nuevo un medioambiente sano y protegido. Felicidades y éxitos en tu carrera Stephany Alvarez Ventura!